There are few ways to make Tomato rice with little variations. Few methods involve of making tomato gojju (sauce with spices) and mixing with boiled rice. Another way of making is like pilaf/pulao which is made in pressure cooker or a pan. Whatever the variations and method, love Tomato based rice. 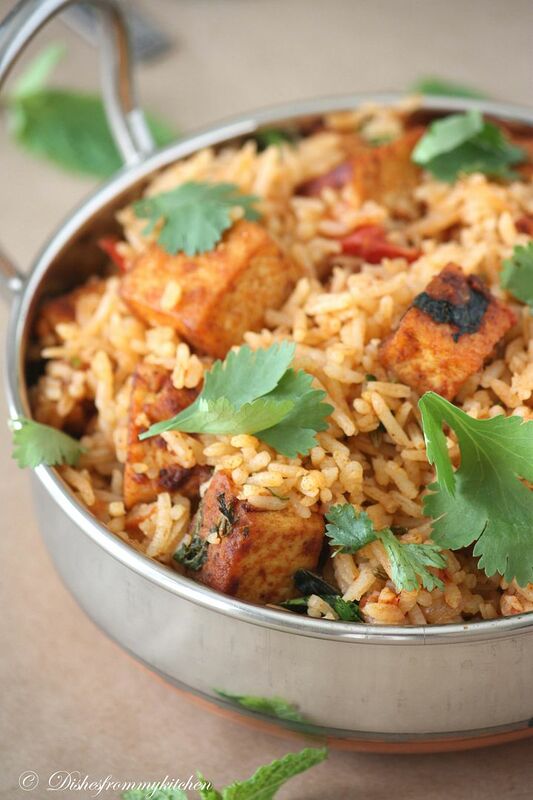 The rice which I am posting today is Tomato pulao with Masala seared tofu, If any you don't like Tofu, I am sure you will start loving tofu this way. Tomato with tofu is excellent combination and with some Masala you will not find any soy smell in the Tofu. Do try and let me know how you liked it. Click this to see another variation Tomato rice which I have posted earlier. And also stay tunned to see my childhood favorite Tomato rice which my mom makes and packs us for lunch. 1. Make paste out of Ginger, garlic and saunf, Wash and drain Basmati rice and keep it aside. 2. Now heat oil in the pressure pan or heavy bottom pan. 3. Add the whole spices followed by slice onion, slited green chilli and ginger+garlic+saunf paste. 4. Once the raw aroma of garlic disappears. 5. Now add the Tomato and sauté till all the moisture is absorbed and you will get sauce like consistency. 6. Add Chilli powder, garam Masala powder, mint leaves and sauté. 7. Add measured water and coconut milk, add salt. 8. When it comes to boil add the drained rice. 10. When steam comes, put the whistle. Keep the flame to very low. 11. After 10 to 12 minutes switch off. 12. Give 10 minutes resting time, now open the cooker, add chopped coriander leaves and seared Tofu and give a slight mix. 13. Serve with your favorite Raita. 1. Heat oil in the pan; add the whole spices followed by Tofu cubes. 2. Let it sear for few minutes in all sides until light brown in color. 4. When everything is will blended and seared, add dash of lemon juice. 5. Mix this seared tofu with rice while serving. 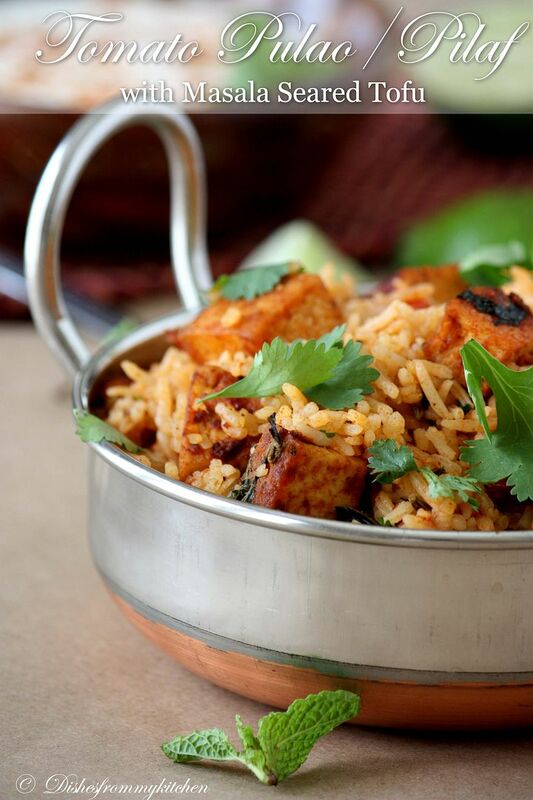 You can also substitute Tofu with Paneer in this recipe. 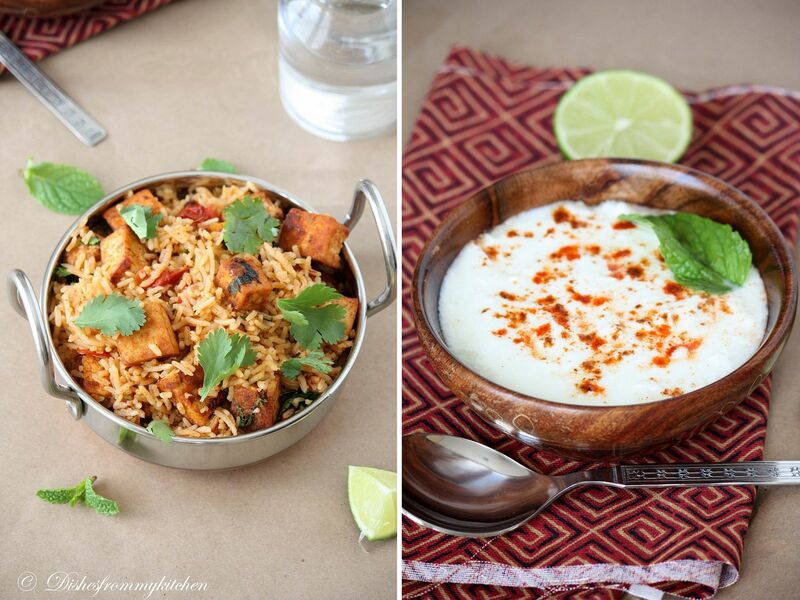 Enjoy Tomato Pulao/pilaf with Masala seared Tofu with Raita!!! Awesome..Love all the flavours in this..
amazing... I am doing two up n down scrolling. one for pictures first and for recipe next. I enjoyed it overall. super clicks. Great pictures! I love the colors of this recipe and I can feel the smell, yammy!! Delicious pulao.....I can almost smell the aroma. My husband is not a tofu fan , so maybe I will try it with paneer. 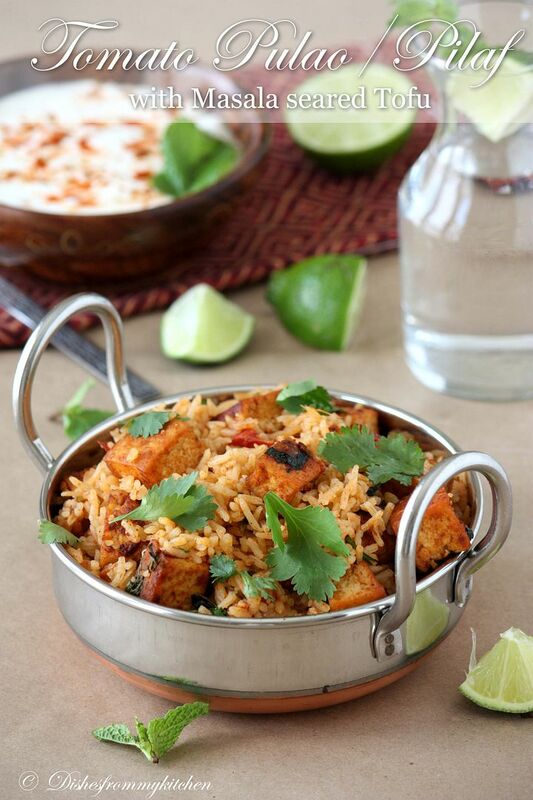 Awesome recipe n pics, love the spicy n tangy pulao with the protein packed tofu..
Love tomato rice for its tangy punch..nice addition of tofu in it.. 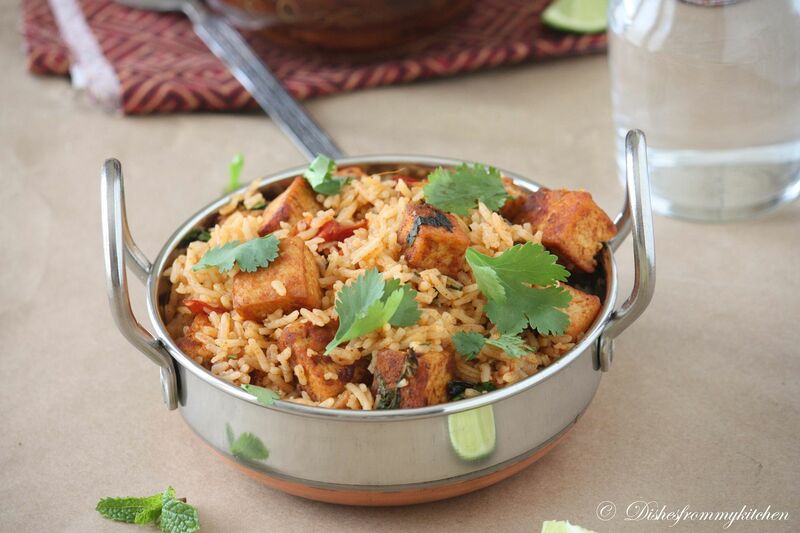 Awesome tomato rice with masala tofu combo. Love this varation...I also make one variety where I make a tomato gravy and cook the rice in it. Lovely clicks. I always try different versions while making tomato pulaos. This one looks protein packed with the addition of tofu! Omg, super delicious and irresistible pulao..
Tomato pulao looks absolutely flavourful and divine. Brilliant work girl..:) Loved it.. I am all good with tofu, you would think as a vegetarian I would do more with it though...this is so wonderful, and a reminder to utilize more with this. The flavors here are just incredible! i usually do not like tofu, however healthy it is. I guess adding those flavours and giving it a spiced taste might make it better and in the tomato rice it adds to the protein content! A complete balanced one pot dish! Very very inviting and loved your version. Amazing colours too. Awesome. One more recipe that I have bookmarked. looks too good and yummy! its a different Idea..
Love the recipes on your blog! The delightful pictures have made me hungry! The rice looks delicious! First time here. You have a lovely blog with so many yummy recipes n lovely clicks. 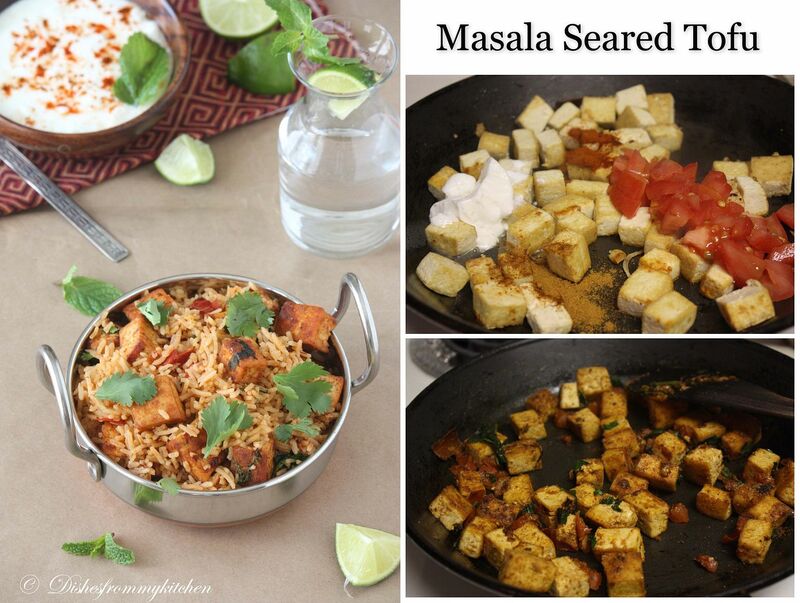 first time here.. liked your recipes a lot... fabulous pictures... tomato rice and tofu is a wonderful combination... glad to follow you... do visit my blog sometime..
That looks so delicious! Your pics are very impressive! looks real yumm!pics look fab.. Very nice recipe for tomato rice and the tofu should be a nice accompaniment for this,loved it! Sorry for my late comments pavi.